I’m in the middle of a knitting project that, simple as it is, has caused lots of frustration. I knit the way I cook: I follow the recipe (pattern) exactly, and easily get overwhelmed with two pans on the stove and one in the oven (with two skeins of different colored yarn and four needles and the protruding handiwork snaking its way down my palm and getting in my way). But when I get it right, I get it right. And it’s lovely. However, I noticed recently that if I dropped a stitch or forgot to stripe or purled instead of knit, I would stare at the needle tips for a split second and mentally pressed “Apple Z”—and actually expected my mistake to undo itself. 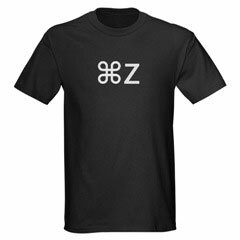 For a year now, I spend my workdays mousing and keyboarding and when I was new to Macs in the beginning, my coworker reminded me that “Apple Z is your friend.” I’ve probably done that keystroke hundreds of thousands of times. It’s my buddy and wingman. It saves me from my silly mistakes, in an instant, with little effort on my part. I guess this expectation has dominated some zone in my mind because commanding my needles to Apple Z has happened at least four times. And when it doesn’t happen, frustration flares like a grease fire, I blush, then undo my error the old-fashioned way. I think about writing (with a pen) blog entries when they come to mind, but if I’m not at a computer I don’t bother because it’s not as fast as typing. I can’t cut and paste. Isn’t that so PATHETIC? Augsburg is investing in a new IT infrastructure this year and at the kick-off, our CEO asked those of us in the room under 25 to stand up. (We were by far the minority.) We’re considered natives to technology, whereas those 25 and older are immigrants. I don’t know where she got this information but it seems accurate in a general way (although my dad is the savviest techno person I know and he’s 49). I guess it’s a good thing to be “native to technology,” but at the same time I do take the convenience of computers for granted and apparently the rest of my life is slowly being infiltrated with that expectation of instant gratification.